The Tuscany, a privileged touristic enclave with an undeniable heritage and culture that left a deep and indelible mark on the European civilisation, is the region that is welcoming us next year. 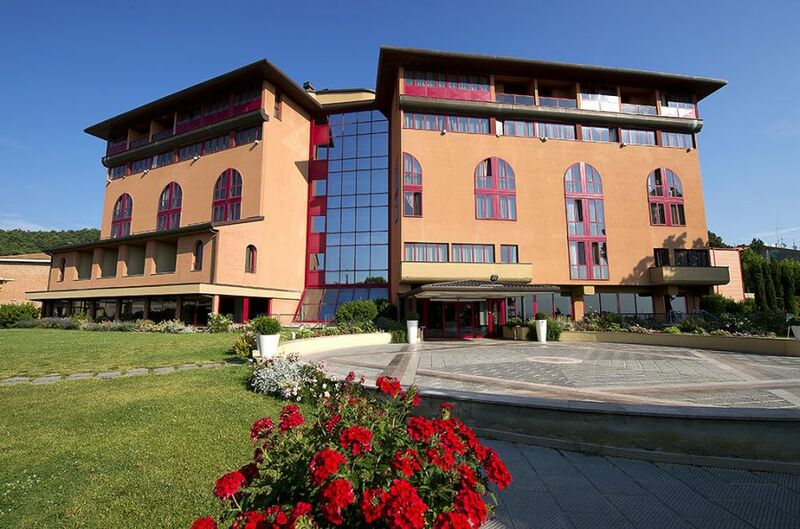 In its deepest and landscape part is the Grand Admiral Palace hotel, located in the centre of the spa town Chianciano Terme, in the wild and in the heart of the Orcia valley and offers its exclusivity during our whole stay and therefore vacancies are limited. There is an outdoor swimming pool, free internet connexion in the whole area, complete facilities and great quality services, beauty and wellness centre. Friday 13th. Check-in#12.00h. Half-board (supper) in the hotel. Documentation delivery upon arrival. 20.00 h. Evening: Euromeeting presentation. Welcoming cocktail and supper. Transfer to Siena by shuttle for a guided tour with a local guide. We will let the city and its historical medieval centre enchant us. It is one of the Italian cities, which have preserved its medieval aspect more carefully, located in the heart of the Tuscany. Siena, born at the top of three hills and still rounded by the well-preserved boundary walls, offers a great number of fine gothic architecture examples and a unique shell-shaped square in the world: La Piazza del Campo, famous for the Palio, one of the most important point for the Siena’s inhabitants. The Palazzo Pubblico, as well as the Siena Cathedral, were built during the government of Nine, which coincided with the economic and cultural centre’s peak of Siena. The palace’s inner courtyard leads to the Civic Museum and the Mangia Tower, over which wonderful views of the city are the reward of climbing the 500 steps. We will start our tour towards the capital of the Tuscany, Florence city, which offers the advantage of visiting it totally on foot. It has been the centre of the Italian and European artistic culture across the centuries, as its many museums, palaces, churches and monuments bear witness. 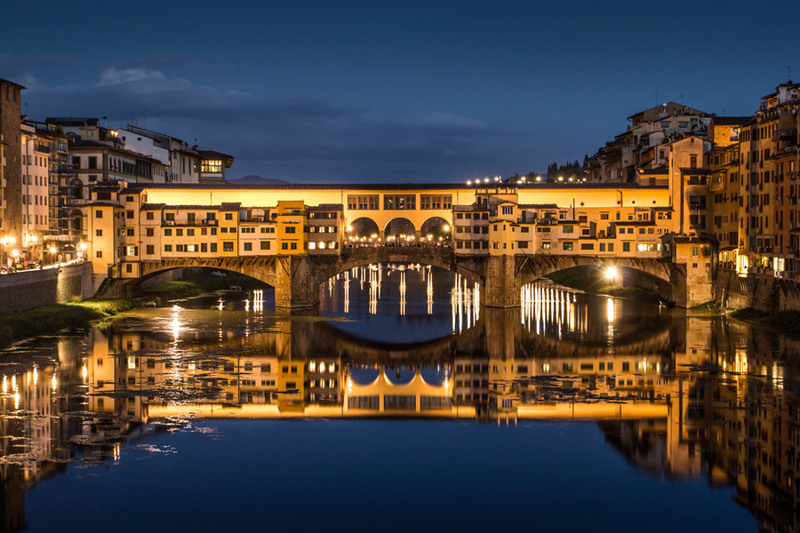 Lined by two hills and crossed by the Arno river, Florence is a city that has known how to take care of its historical heritage becoming in turn an emerging outbreak of the modern culture. Among its historical attractions we will be able to see both in the morning and in the afternoon, after relaxing eating in one of the best restaurants located in the centre of the city, “Fantasia”, the Piazza del Duomo located in the centre of the city stands out. This beautiful square is home to some of the most important artistic and architectural treasures of Florence like the Giotto’s Campanile, the Baptistery, the Ponte Vecchio and the Santa Maria del Fiore Cathedral, one of the most important in the world where great masters including Giotto and Brunelleschi. We will walk past Piazza Santa Maria Novella until reaching San Lorenzo’s market, a historical market that represents a nice and colourful attraction of the Florence’s historical centre and encircles the San Lorenzo Church. Transfer to the lake by shuttle for a guided visit with a local guide. In the green heart of the Umbria region, between small valleys and beautiful white water lilies, raises the Trasimeno Lake up, an authentic natural paradise. The Trasimeno towns, that we will visit, are very varied: some of them appear directly in the lake, some other, in the nearby, enjoys an attractive mirror of water that reflects them. Castiglione del Lago, an old hamlet that dominates the western shore and under which remains of many Etruscan graves can be found. The castle and the ducal palace’s medieval wall can be admired in this small village. In Città della Pieve, calm and characteristic medieval village inhabited both by Etruscan and Roman people back then, is the most narrow close in Italy. This city is the painter Pietro Vanucci’s birthplace, known mostly as Perugino. Another village that we will visit is Panicale, not far#CIttà della Pieve, where we will be able to have one of the best views of the Lake. 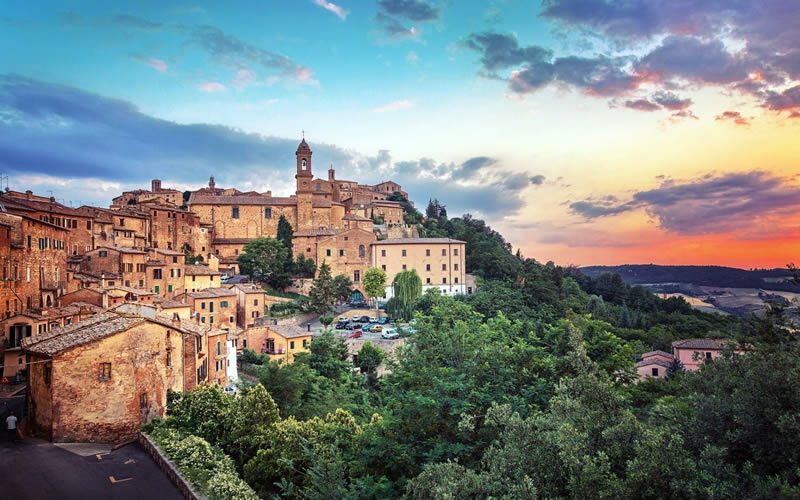 Our trip will start going to Perugia where we will head into its amazing old town as soon as we arrive through a comfortable escalators system. It is a surprise for who does not know it thanks to the ancient and medieval age remains. We will be able to be enchanted by the Rocca Paolina, the Fontana Maggiore, the Palazzo dei Priori, and the Etruscan Arch and taste its famous chocolates in order to head to the restaurant located in an attractive gardened villa to the outskirts of Perugia known as “Posta dei Donini” afterwards. 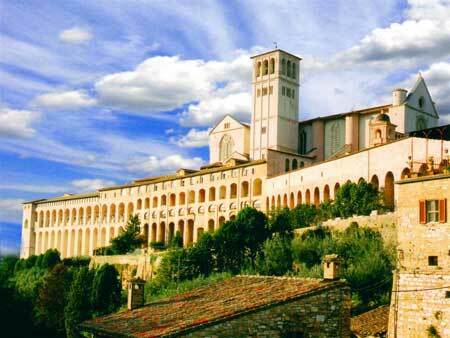 In the afternoon, we will continue our tour to Assisi, Saint Francis’ birthplace, who founded the Franciscan Religious Order, is one of the 49 Italian locations that the UNESCO included in the World Heritage List. According to the UNESCO Committee, this city is a unique model of historical continuity with a very enchanted cultural landscape. Especially, we will see the Saint Francis Basilica, we will visit Santa Chiara Basilica (Italian-gothic style), the Piazza del Comune composed of the Temple of Minerva (1st century B.C. ), the Palazzo del Capitano del Popolo (8th Century), the Torre del Popolo built in 1305 and the Saint Francis Basilica. Orvieto is a city of the province of Terni, in the Umbria region. It is located on an uneven hill, at an altitude of 325 meters over the sea level. Due to its wideness, it is one of the fifty biggest municipalities of Italy. The Duomo is the city’s cathedral and probably its best known monument, since it is one of the masterpieces of the gothic architecture in Italy. In the hearth of Orvieto there is an underground walk composed of caves, which encloses valuable archaeological discoveries inside themselves. Over the centuries, up to 1200 subterranean places were found in the city’s rock: an incredible historical and archaeological heritage. The set is known as “hypogeous Orvieto”. The guided visits to these locations take place through the caves owned by the city Council. The underground has accurate didactic goals that explain the city’s history across the centuries to the visitor. We will head to the villages of Montepulciano and Pienza by shuttle to spend a free-time morning. Montepulciano (41 miles south-east of Siena), quite important farming centre thanks to the famous Noble wine production, is also a kind city with Renaissance shapes. Pienza, city of Pius, is an interesting city, located in the hearth of Val d’Orcia, near Siena, in Tuscany, considered as the personification of the Renaissance utopia about the “Ideal City”. Recognised as a UNESCO site in 1996, it keeps being an example of the Renaissance urbanistic canons brought to our days regarding the rational organisation of space and the 16th century squares and palaces perspective. We will be able to look at its streets and old town in both hamlets. Shopping can be made, its winery can be freely seen and its wines can be tasted in order to head afterwards to the other village for tasting its spectacular cheeses and typical cold meats#the area. Inscriptions: Deadline is subject to availability at the time of application. BASIC INSURANCE INCLUDED against cancellation fees and assistance on destination (Italy up to 8 days). If you wish contracting optional trip insurance, please ask to the travel agency. Airport transfers: Viajes Transvia will provide them#the airports of Rome, Pisa and Florence to the hotel and vice versa upon request for: 60,00 € (Rome), 65,00€ (Pisa) y 58,00€ (Florence) respectively per go and return journey and person (based on a minimum of 30 people). PRICES: The trip prices have been calculated according to the currency exchange, fares, fuels, fees and VAT in force in Spain and Italy as of 01/08/15. Any change in the mentioned fee can be revised and passed on the customer according to the current legislation, and the general conditions included in this offer and attachments (Article 157 RDL 1/2007).